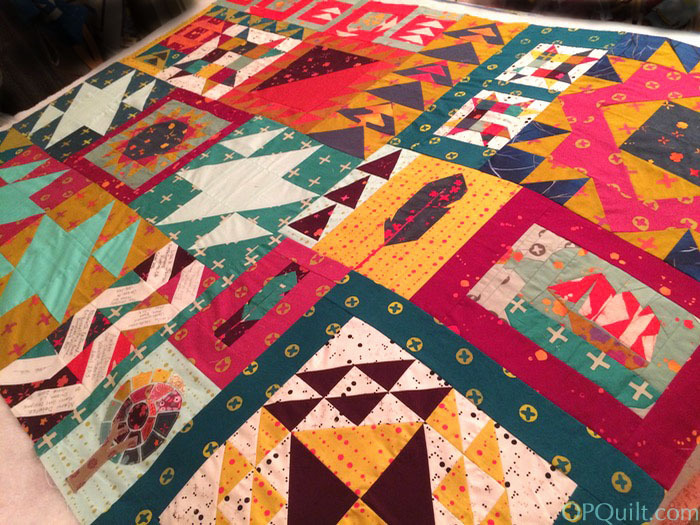 Posted on April 12, 2019 by Elizabeth E.
This quilt, made of 6″ blocks designed by famous Japanese quilter Chuck Nohara, is finally finished. We took it out to the local area for some shots with wildflowers, as it’s been such a beautiful year. My husband was the best quilt holder (thank you, dear). Although her name reads masculine, Chuck Nohara is a woman who taught quilting to many in Japan in the 1970s and 80s. While I am currently past 200 quilts in the listing, I first posted about this top at the #188 slot. Rather than rework my lengthy listings, I decided to slide it into place where I first wrote about it. 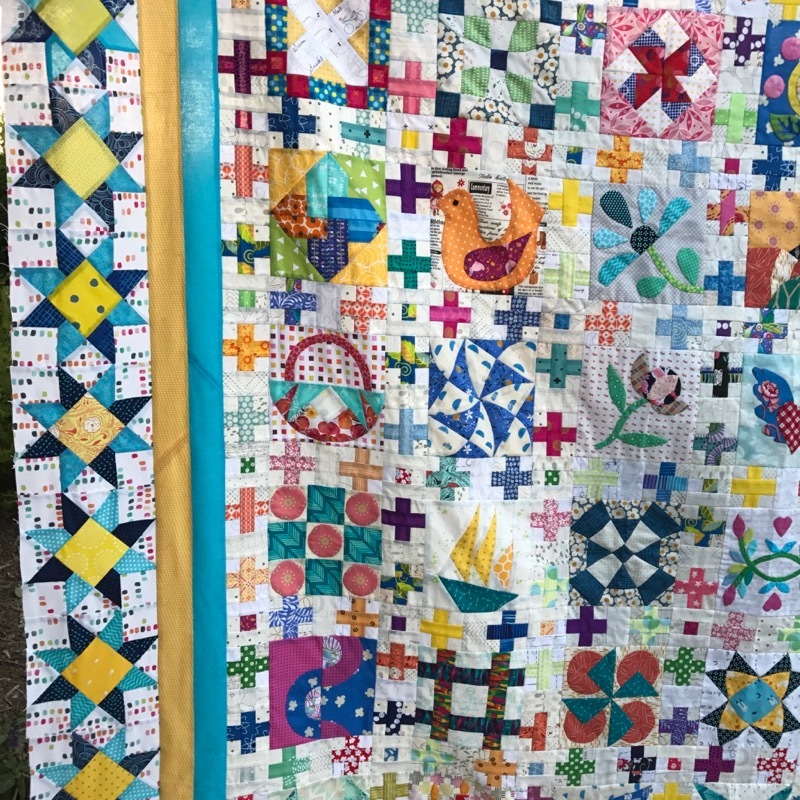 I will link it to this post, showing its completion (which is why I don’t like to only post the quilt tops, preferring instead to number the quilts when they are finished). Why has it taken so long? I had always wanted to quilt it myself. 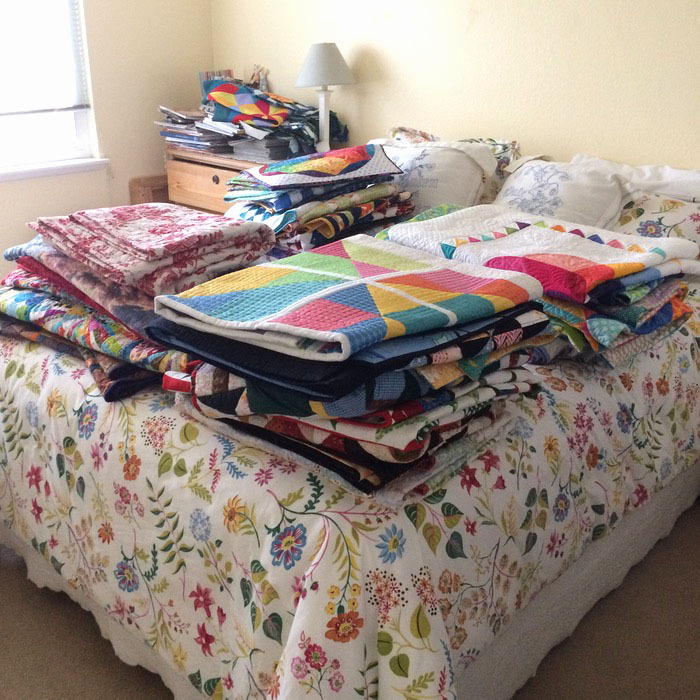 But one bad week during my recent recovery from rotator cuff surgery, I realized (or believed) that I would never quilt again, so had my husband help me box it up and send it off to Darby for quilting. I chose this meandering loopy pattern for the quilting, and I’m quite happy with it. The title comes from a poem by Robert Pollock, a religious poet from Scotland. 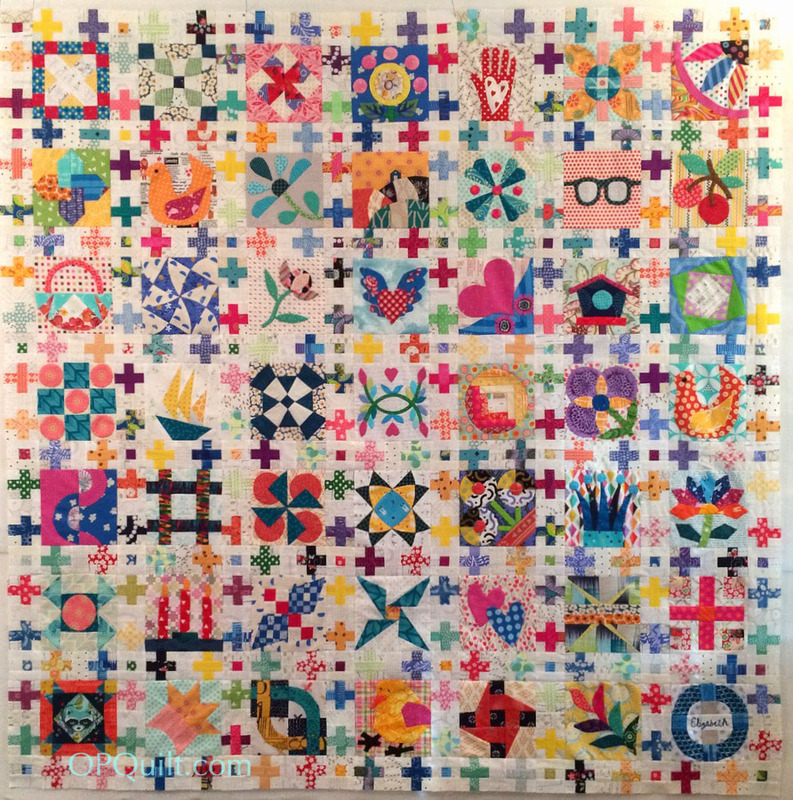 I liked the idea of that line, that we are all friends in heaven, as this quilt was made when Susan from Australia, and I (from California) corresponded and chose blocks to work on, as we both had a hankering to make a “Chuck Nohara” quilt. That seems so far away, although with FaceTime videos, emails and notes, the distance does shrink. When I first did research on all these little tiny blocks, one blogger called them Friendship Blocks. They were made by the hundreds by Japanese quilters, sent in to teams who would take all the blocks, make quilts with them, which would then be auctioned off with money going to charity at the Tokyo Quilt Show. 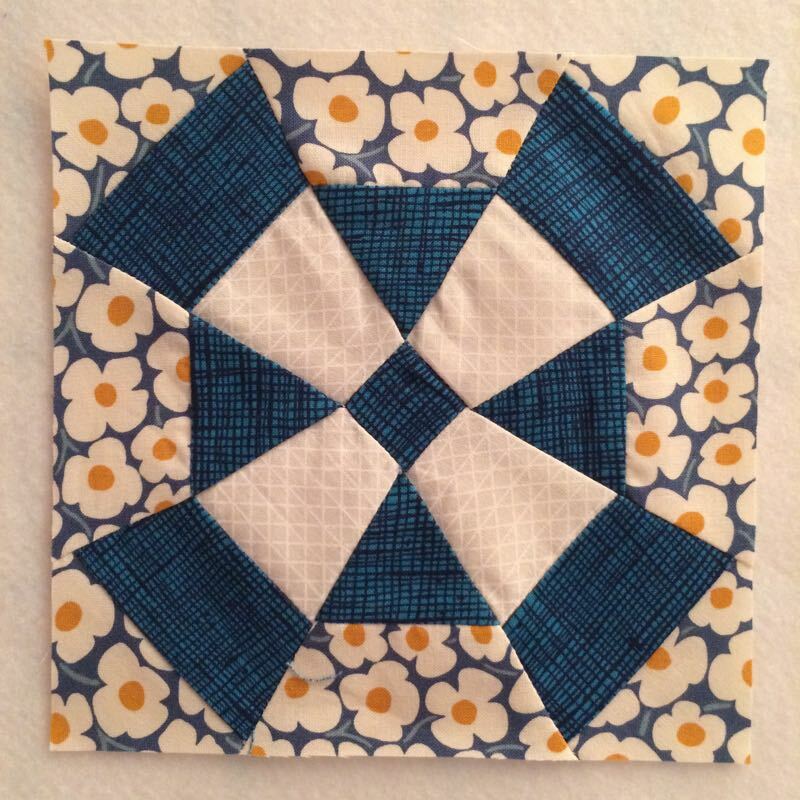 Now these blocks are pretty widely called Charity Blocks, but because Susan and I, friends across the ocean, chose to make them together, I’ve always thought of them as an expression of friendship. And as we participated in the online groups, we made other friends. So they still remain Friendship Blocks in my mind. We each chose two per month, and I’d make a little sign like this and we’d put them up on our IG accounts and blogs and get to making. 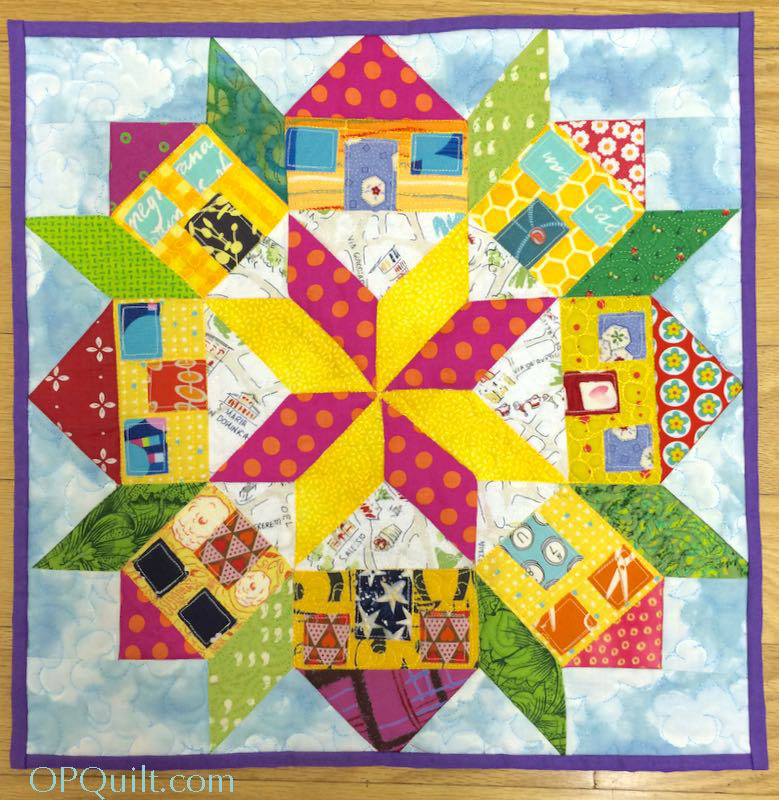 I realize that the quilt photos in this post are from far away, you can head to the link #chucknohara_opquilt on Instagram and see all the blocks that I have posted. We also tagged them #chucknoharaQAL so they’d be grouped with others around the world who were making these tiny blocks. The upper left block is her signature block. The lower right block is mine. I planned that the outer stars would run from deeper green, to yellow, and back to green as they moved along the edges. Chuck Nohara Quilt Top Finished! Posted on October 4, 2017 by Elizabeth E.
We interrupt this tour of France and the European Patchwork Meeting to bring you breaking news: I finished the Chuck Nohara Quilt Top! My husband held it up for me, but it’s big — about 80″ wide, and similar height. And then we made signature blocks for each other, to commemorate that year-plus of making weensy little fussy blocks. (How did we decide to do this? Blame the Chuck Nohara QAL Instagram Feed.) The above signature block is hers, surrounded by my tiny plus-sign blocks and the final star borders. I have other posts tagged with “Chuck Nohara” so you can either click on the label at the bottom of this one to get more info, or do a search in the box to the right. Sometimes it’s fine to have some good quilts. I love so much of what I learned with this quilt–so many different techniques. But I’m also glad it’s at this spot. I’ll bring it back when I finish quilting it, but for now, I’m putting it up on the 200 Quilts List. 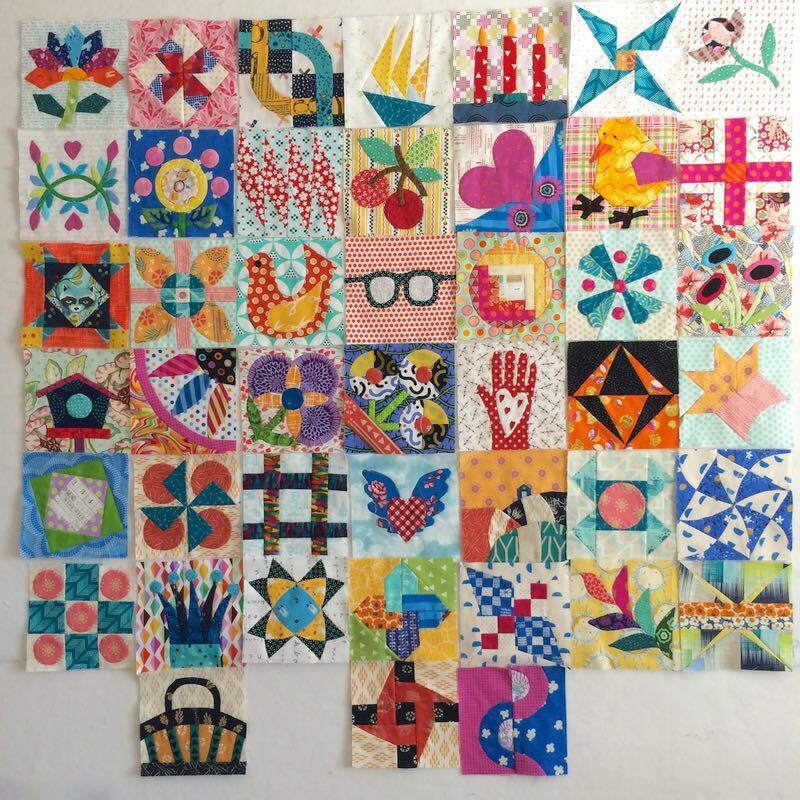 Posted on June 16, 2017 by Elizabeth E.
So, I really have to get serious about my Chuck Nohara quilt borders, because it’s acting like New Jersey’s Bridgegate: closing down my creative roads. 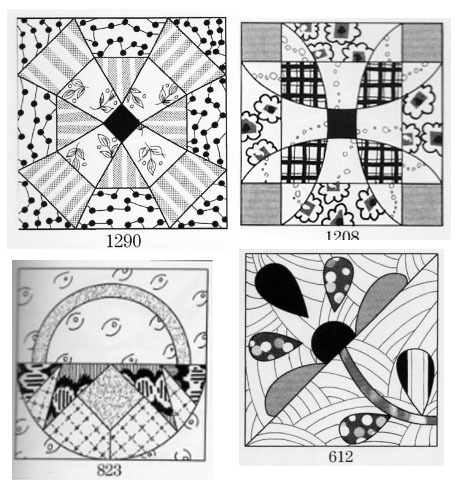 In fact, after looking at all these (found here on my Pinterest Board), I wondered if the Chuck Nohara blocks were an outgrowth of these quilts made by quilters in Japan (or did her work come first, and then the quilts?). Those who want to participate all make small six-inch blocks, submit them to the chairperson, who organizes then to be sewn into quilts which are then auctioned off for charity. 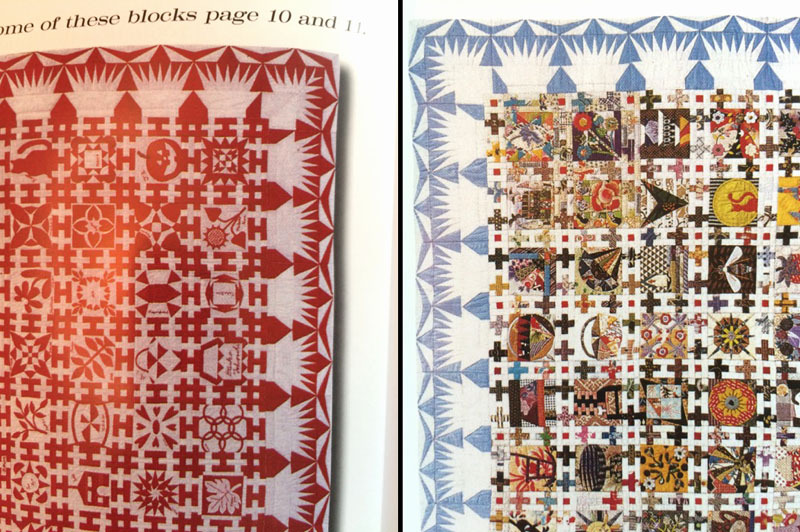 In her quilt in her book, Chuck Nohara sashed with small plus blocks, and I followed her lead. 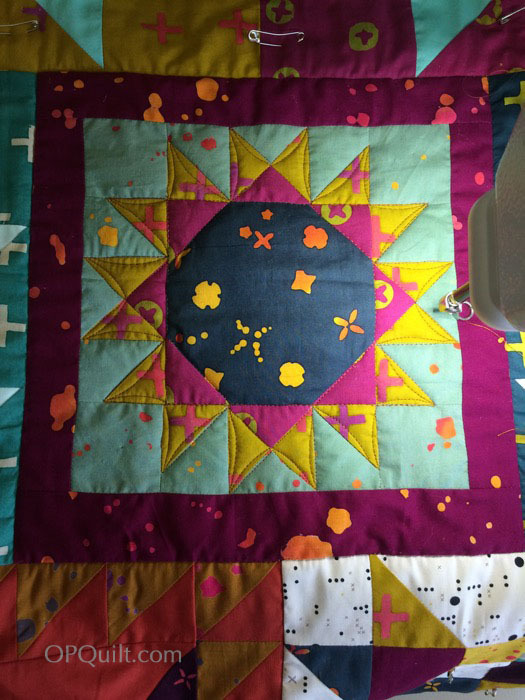 But I liked, how in the quilt above, hexagon circle blocks (which look like signature blocks) created a border. I cut a lot of pieces, but since those star points are alternating and directional (and I wrongly cut some fabrics back-to-back) I’ll have a lot of “extras.” Oops. Maybe I’ll make some more stars for another project. Here are the blocks I’ve finished, residing next to the “quilt middle” on my design wall. I decided to try and do a ombre-style effect with the block middle, moving from yellow to yellow-green to green to yellow-green back to yellow as it goes around the edge. We’ll see if I can pull it off. I’m listening to this, as I stitch away. It took me a bit to get into it, but now I’m in the groove. We could use a few more gentlemen and gentlewomen in the world these days; guess I’d better start with myself, learning how to seat people at dinner parties. I can think about this as I make my 48 blocks. Posted on May 10, 2017 by Elizabeth E.
I finished my Gridsters Bee block for Rachel. She asked for buzzy bees, as she is a beekeeper in the Midwest. 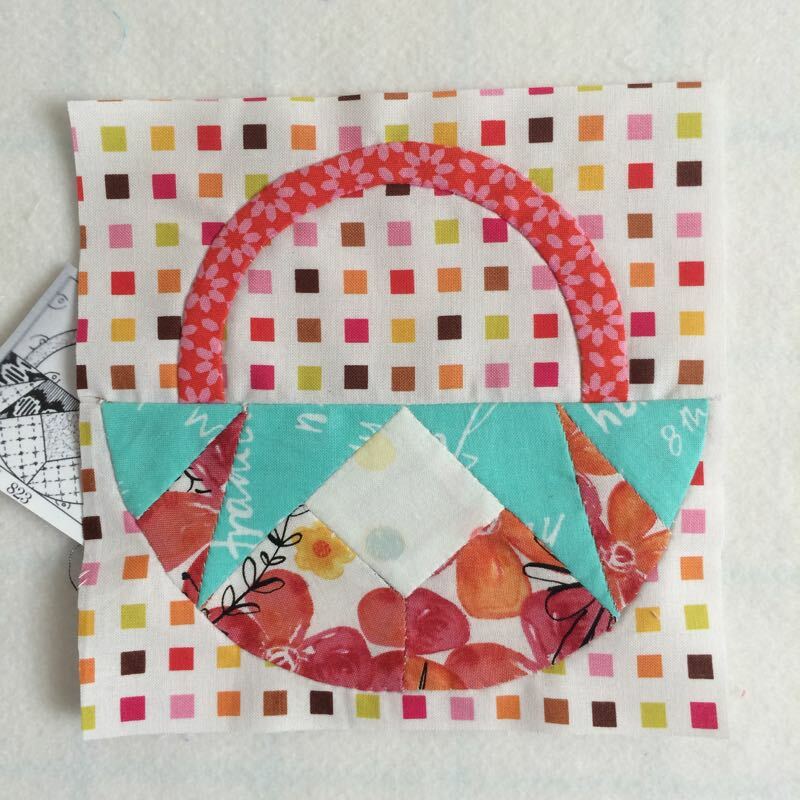 Her tutorial is *here,* as well as links to her pattern, but I didn’t cut apart the pieces. I just straight paper-pieced the thing, then joined the head section to the body section. We blew up the basis 6″ pattern to make 10″ finished bees. I can’t wait to see what she does with them all. This is beginning to feel like the never-ending quilt. I then cut matching pieces of fabric into 1 -1/4″ x 2-3/4″ bits. 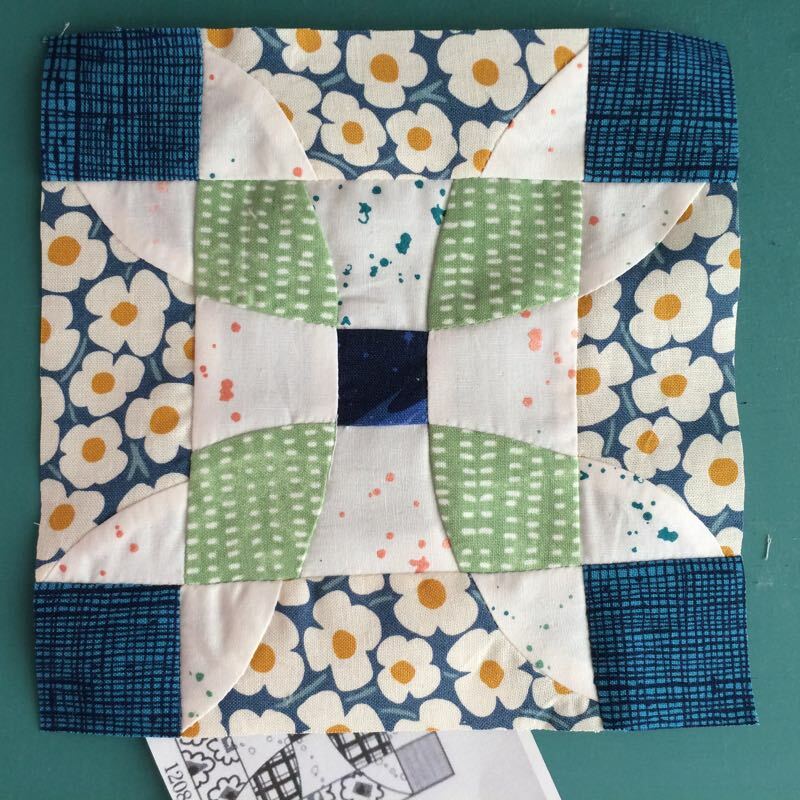 I sewed a matched set of two strip-set-blocks, one on top, and one of the bottom to make a “plus.” Then I sewed 1 -1/4″ x 2-3/4″ pieces of low-volume on either side of a “dot” to create the mini block that is at the intersection. Then the low-volume center piece, in between the two plus blocks, measures finished at 2-1/4″ by 1-1/2″ (so cut 2-3/4″ by 1-3/4″). 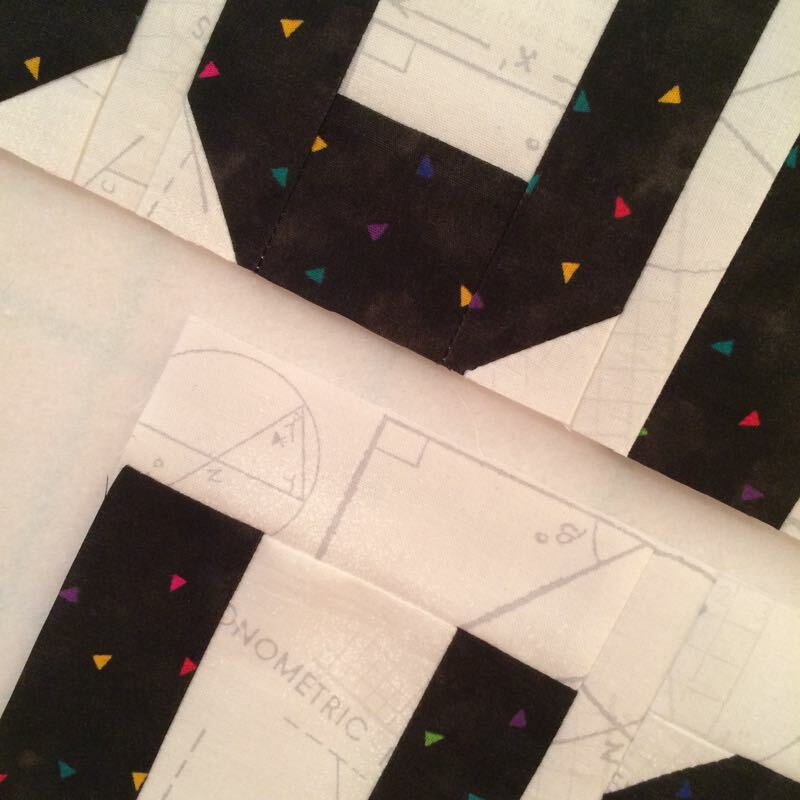 The “plus” and “dot” units finish at 2-1/4″ square, so trim them to 2-3/4″ square (size before sewing). I’ve finally progressed to the place in my physiotherapy (I like the way the Australians say it, as we just call it “PT”) where I could try out my Sweet Sixteen quilting machine again. After 3-1/2 months. It took me a while to get the thread tensions balanced, but then was I able to get going on my quilt from the Traveling Threads Bee, made of Alison Glass fabrics (with a few others). Bliss. 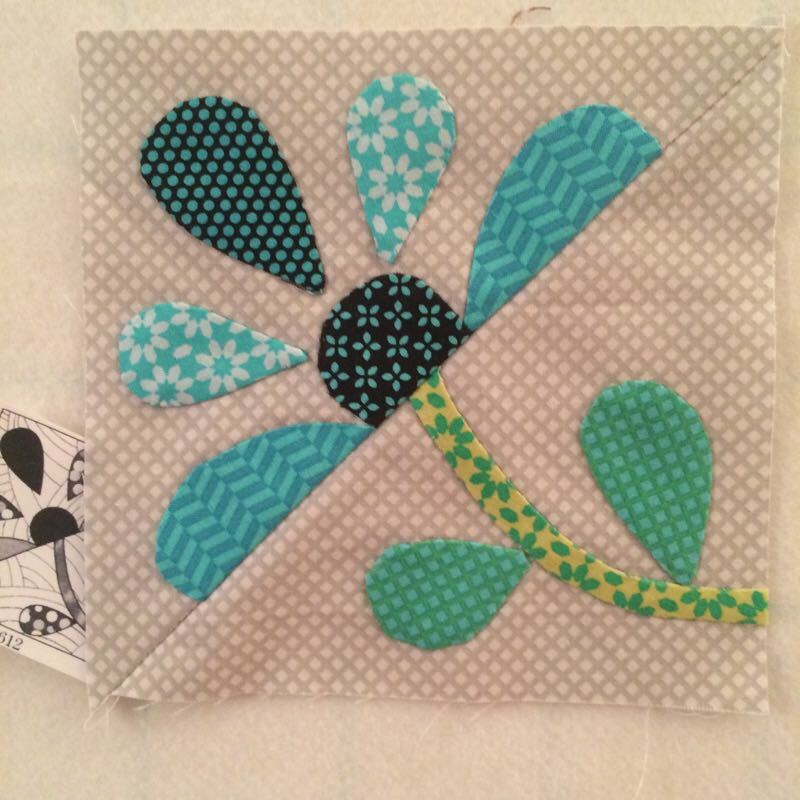 This block, from Toni of HoosierToni, is coming along nicely. I’m limiting myself to 30 minutes/session so I don’t break my surgery (my one big fear in life). 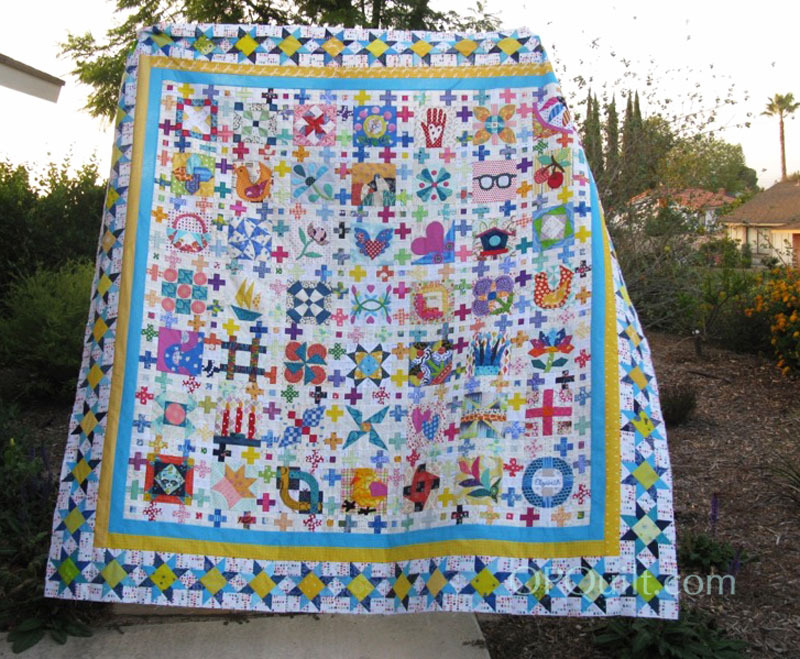 Lastly, you are all invited to our Raincross Guild Meeting this coming Tuesday, May 16th (6 p.m.), where I’ll present a trunk show of my quilts–well, only 25 of them. My husband helped me get them from our closets, walls and cupboards, so I can decide the order and what to say. I just clicked over to the Guild’s website, and in true humbling fashion, I’m not even listed. But Latifah Saafir is, on the day I’m supposed to teach a class for the Guild, too. What will I be teaching? My Home, Sweet, Home mini quilt. I think they have a few openings, but I’m not sure. I’ll be emailing the class members prep instructions, that if they complete them, they will finish their quilts in class. That’s June 3rd, from 9 a.m. -2 p.m., with a 30-min lunch break (bring your lunch). Last time I taught this class, I was able to snap a photo of three Home Sweet Home quilts. They look awesome! Patterns are for sale in my Craftsy shop, just in case you aren’t able to attend that day. Posted on November 9, 2016 by Elizabeth E.
First up is finally completing my little house quilt, which I titled Celebration. 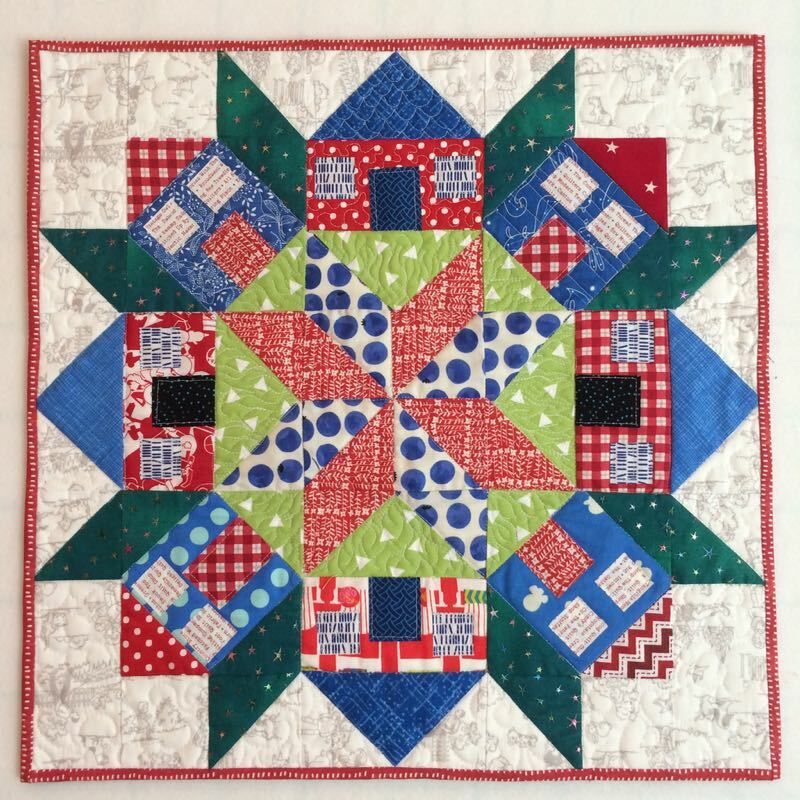 I thought it was a 4th of July house quilt, but now I think it may be sort of Christmasy (or not), so I went vague on the title. It’s made from my Home Sweet Home Mini Quilt pattern, and works up quickly. I need to make a Halloween mini houses quilt. Soon. And since I’m still jet lagging, this is the label, so I can call it done. I love that fabric on the back. Sometimes I get discouraged about the pile of stuff around my sewing room, and realize one reason why I don’t get a lot completed (which is why I pushed forward to get that little house quilt done) is because this has been a year of traveling. 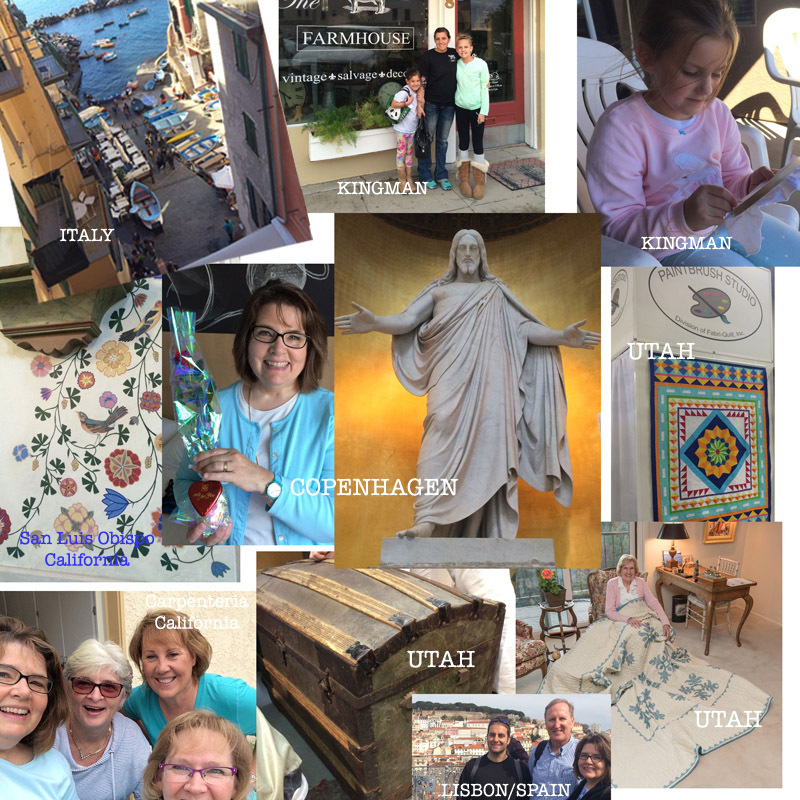 Other trips not on here are Kansas City, San Diego, Sweden (which was in conjunction with Copenhagen), and Switzerland. It’s been fun, but now I’m ready to stay home for a while. 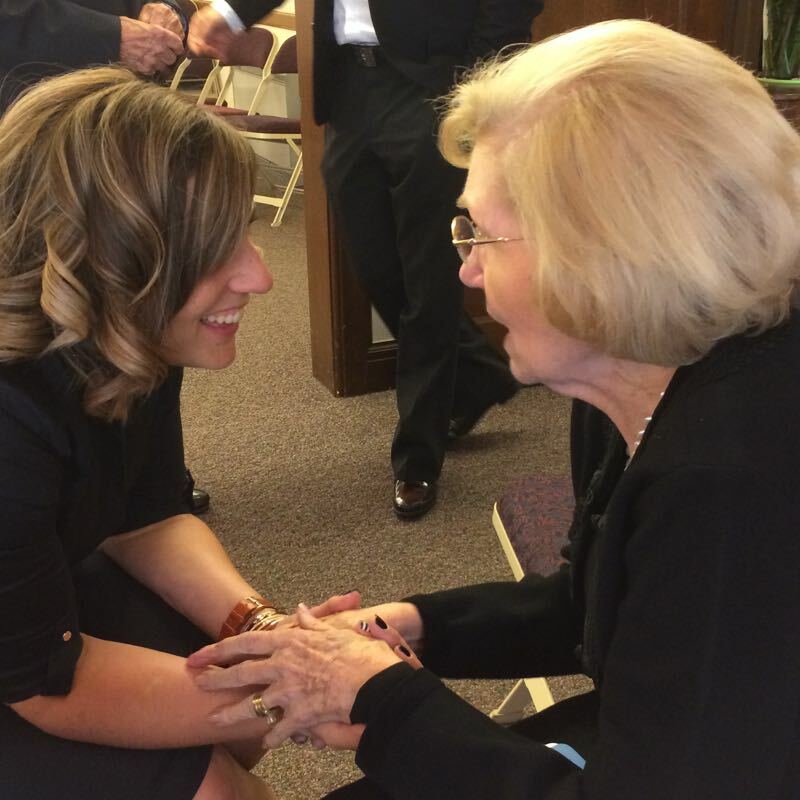 I snapped this photo of my daughter and my mother together (my mother’s namesake) while we were in Utah, another one of our trips. I finished up my final four Chuck Nohara blocks. I really like this one, and plan to use this design again. I finished up Cindy’s blocks for our Spelling Bee group. 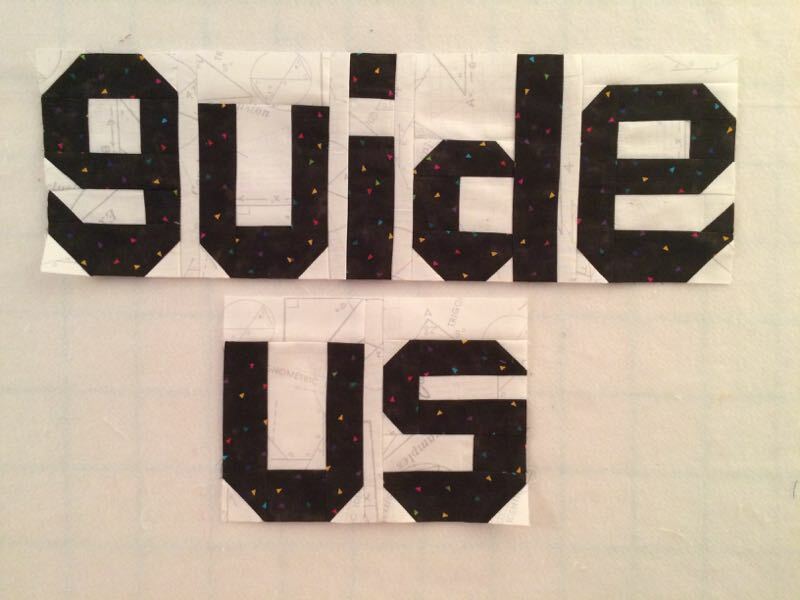 Our group worked together for a year, swapping blocks with each other as we made words based on the alphabet on my Quilt Abecedary Blog. She asked for dark fabrics on low-volume backgrounds for her words. Since her blog name is Live A Colorful Life, I couldn’t resist this black fabric with little bits of colorful triangles floating around in them. I also finished Nancy’s blocks for her request on Mid-Century Modern Bee for November. 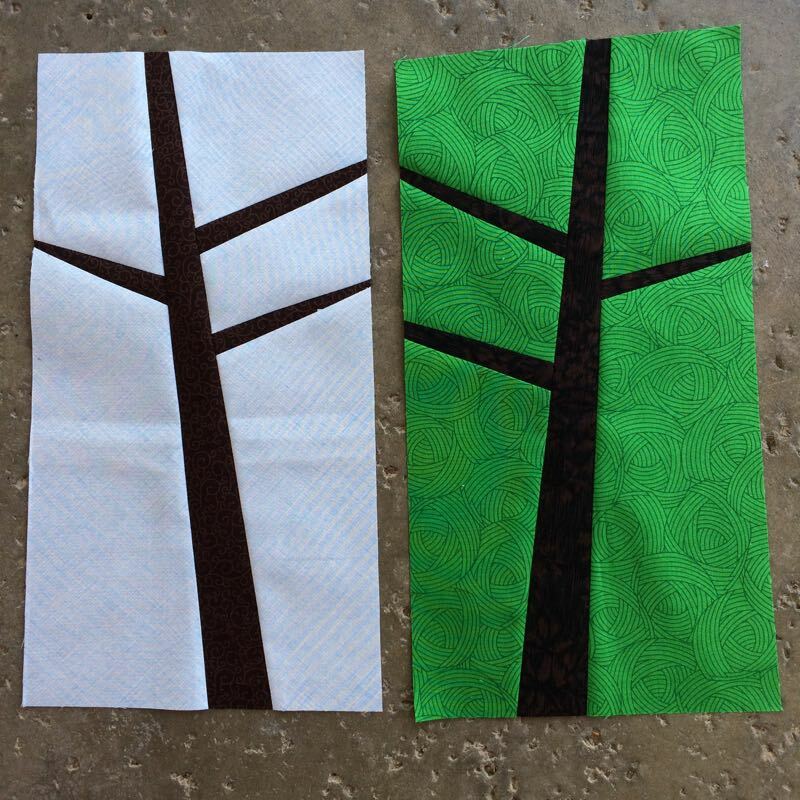 It was a slash and fill approach to making trees, one on light blue and one on green. I hope she likes them. She’ll trim them up to her preferred slant, so they are bigger than she requested (she wants them at 6 1/2″ by 12 1/2″ finished). After four years of working together, our fearless leader decided it’s time to go, so I have only one more block to complete. I see a lot of bees collapsing and going away, as people seem to have moved on to doing QALs or 100 Block Assemblies. I am still part of one bee (Gridsters) which, as a mark of faith in the bee concept, begins next year anew. I enjoy getting to know the women I trade blocks with over time, and will continue to follow them even though the bee is ending. 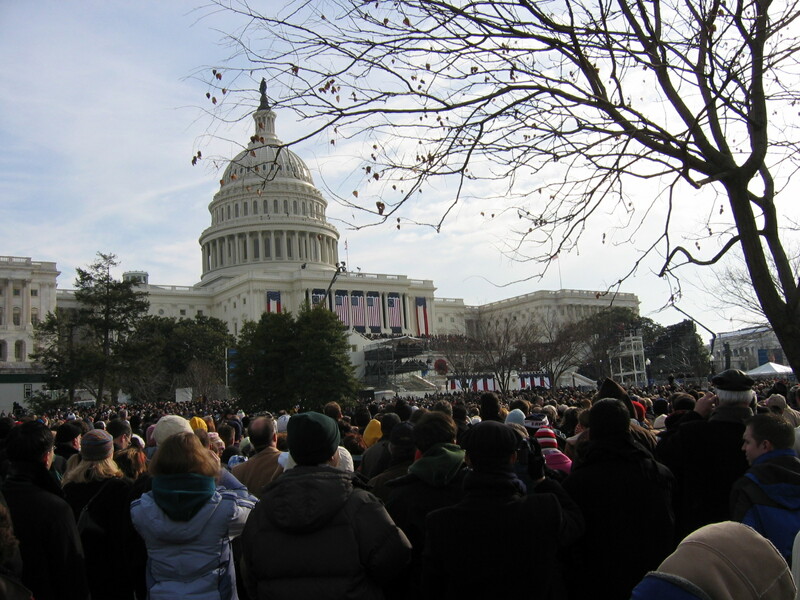 Finally, a note about yesterday’s election: In 2004-2005, I lived in Washington DC for a year, while my husband took his sabbatical at the State Department. 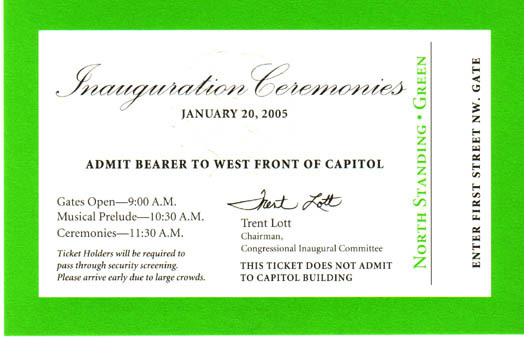 I was able to attend the Inauguration Ceremonies of President George Bush’s second term. I did not vote for the man, but attended this display of our nation’s ability to keep our system of democracy rolling forward. That cold January day was an emotional day, full of patriotism and pride in our country. When I was in DC a couple of weeks ago, they had already started building the massive platform which will hold the band, the dignitaries, the guests, and the future leaders of our country. 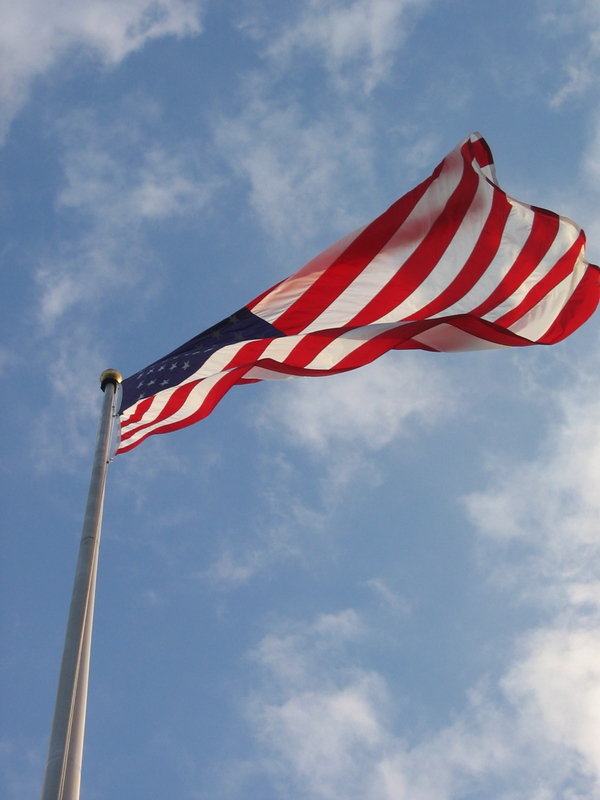 I applaud our country’s ability to focus on what’s important, and hope that I can some time soon feel more enthusiastic about our recently elected officials, in both the Executive and Legislative branches of government. I still believe in our democracy, and am glad to have participated in expressing this belief by casting my ballot Tuesday morning. Final note: usually when I can’t decide how to typify my posting, I call it a This ‘N That post, and just throw stuff up. The downside? The title is so vague, if I scroll through later, I can’t tell what I’m talking about. (I also have the same problem when I visit my friends’ blogs, looking for something.) Thankfully, the search box on this blog is run by my software, so you can find just about anything by typing it in the box. Posted on October 10, 2016 by Elizabeth E.
Well…I posted this photo recently, musing about how many more of these little suckers I was going to make. Since they come from 2″ line drawings in Chuck Nohara’s book, any size is possible, but Susan and I went with 6″ finished. Which is fun. And small. And I still have to make all the sashing and all that, so it has come to the time to think about sizing. I tend to like square quilts. And with four more, this quilt would be square. I know I have 4 per month, three more months, but RETURNING to my senses, I realized I was pretty much done. As one of the more fun quilt projects I’ve done, by teaming up with Susan gave me great motivation to get things done (because I knew she would). If you jump in, try hooking up with the Instagram group and letting the motivation of those women pull you along. But still, it’s time for me to be done. I chose from the rest of what we’d identified as the last blocks of the year, pulling forward ones that I thought would blend with what I already have. This also gives me a chance to take off my least favorite block and move it to the back (I’m not telling which one it is). 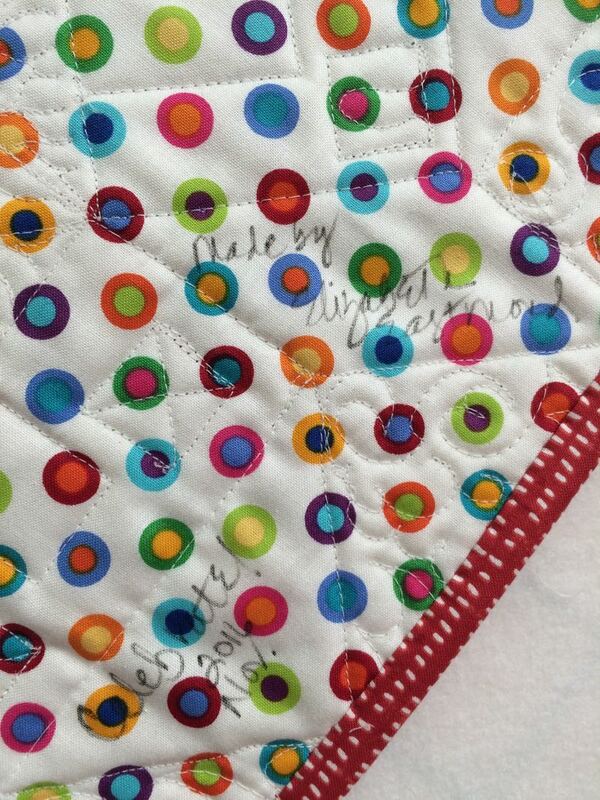 Susan and I have also agreed to make each other a signature block, but keep it a surprise, so I have that one too. Whatever is leftover after all this will go on the back. Most of the people I know are compulsive starters. We constantly create new projects, companies, organizations, and events; sometimes, we even get roped into adopting other people’s projects and entities…Almost all of them will not be the last thing we start. She goes on to say that we don’t often know how to finish up, or end, all these projects we’ve started (we quilters call them UFOs). She notes there are five categories of projects-that-won’t-quit, with “The Indefinite Life Support” being the first. That’s when we keep a project going way past the time it should be allowed to lapse. Think of all those 100 block projects you’ve been seeing all summer. Some actually do go all the way, but I say, if you get to #47 and you’ve learned what you had to learn, and you are ready to move on. . . then don’t feel guilty for not having A Complete Set. Another category is “The Marathon,” when you carry on a project to the very end, but it burns you out or causes harm. I had two of those this year: the Halloween quilt-a-long, and the Oh Christmas Tree quilt-a-long. I loved doing both of them and have two lovely quilt tops to show for my efforts, but when I got to the part in Oh Christmas Tree where the pattern was wrong, it threw a big wrench into my Enthusiasm Works and I really had to run my own marathon to get that project finished (we corrected it). Doing one quilt-a-long is huge, but two was like running two marathons at once. Accepting the possibility of the end means periodically taking a critical look at your work and recognizing when its time has passed. 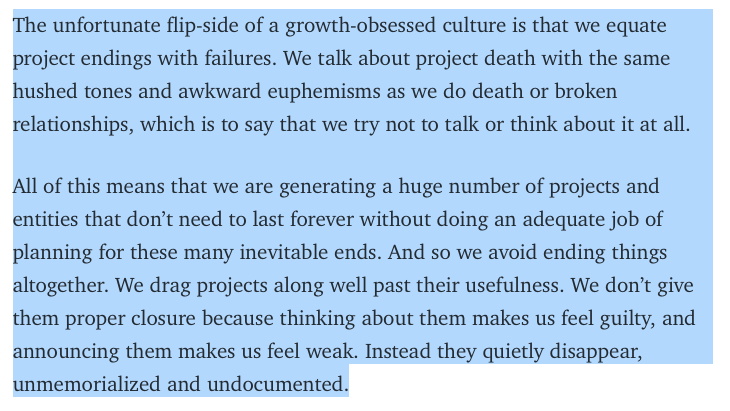 Letting go of a project or an organization returns all of the resources it’s tying up — funding, attention, time, the emotional labor contributed by you and others — to the ecosystem. Whether by you or others, those resources will be recombined into new, surprising forms….The end of something, when unrushed and deliberate, is a time for celebration as well as closure. And so I celebrate the end of the Chuck Nohara project. I still have several blocks to make, and then there is all that sashing, but it feels like a good time to wrap up this portion and move on.